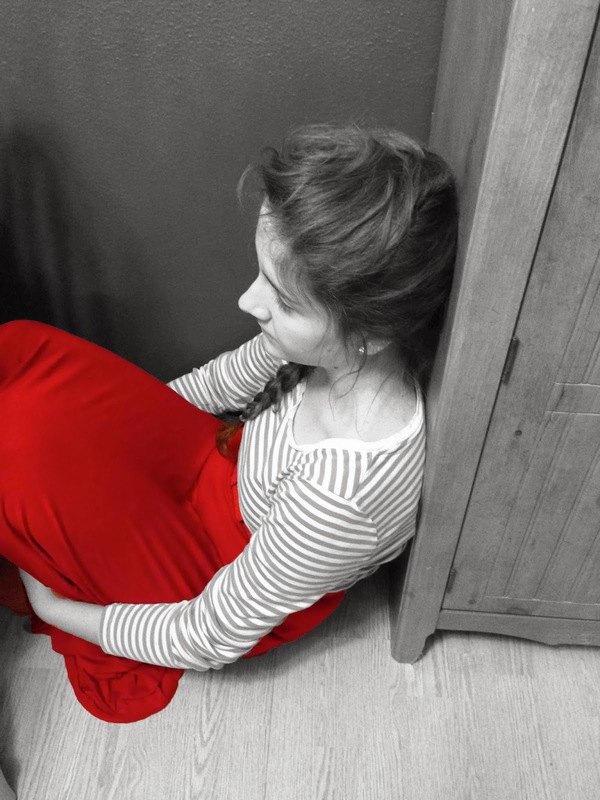 She can't help but think this is a little strange because she is usually not the type who sees a corner and decides to go and hide in it, just sitting there, back wedged against the wall and a cabinet. She especially shouldn't feel like this when the floor is cold and the space is slightly cramped because she both is not a fan of cold and is claustrophobic, hating to feel trapped and confined. Yet, she is sitting here in the corner none the less. In this corner she feels small but safe. She feels that as she is considering so much and trying to find direction in life there is finally something solid beneath and around. With her head resting against this cabinet, she wishes that all the answers to decisions would appear and that life could sort itself out. If only she could just snap her fingers so that all of my life's fragments would arrange themselves and present themselves. She doesn't know how to stop this aching, empty feeling in her chest. What would life be like without this corner? If this corner disappeared, an exterior wall to the house would also vanish leaving the house exposed to all kinds of things - weather, intrusive strangers and animals to name a few. The house would be practically ruined because who would want to live in a place so vulnerable? If the other side of my corner - the cabinet - was gone along with all its contents, her family would be left without a lot of food and storage containers. That would mean she would be one hungry child. It would mean frustration for her mom as she tries to find a storage place to replace that of the cabinet in our already small kitchen. Those are just some negative things immediately apparent if this corner disappeared, and she knows it has more functions than those alone. (It's a pretty awesome corner, after all, which is great for sitting in as she just found). Truly, the world would be a different place without this corner. She can't help wondering if the same is true of her and all of us today. Just as this corner has a myriad of purposes, we must as well. Some purposes we openly see and realize, yet others may remain a mystery. There are actions we preform with visible impacts - talking to a lonely girl and making her smile, sitting with grandma and listening to her stories, helping little sisters with homework, and giving advice to a hurting friend. Yet, there are purposes for our lives that we may not be able to see just yet and plans that God is waiting to reveal to us. He knows what He is doing in our lives and is working it out in His perfect timing. Sometimes, we just need to trust Him in the meantime.